Marking 100 days since US President Donald Trump ordered the State Department to relocate the Embassy to Jerusalem, Palestinian political parties and civil society movements held mass demonstrations across the Gaza Strip and West Bank on March 16, 2018. Israeli soldiers injured hundreds of protesters with live, rubber bullets and tear gas. According to the Palestinian Health Ministry in Gaza, 25 protesters were wounded after hundreds of Palestinians held demonstrations along the Israeli wall that besieges the coastal enclave. Israeli soldiers shot live fire and rubber bullets at peaceful demonstrators. Five were wounded in Beit Lahya, four east of Jabalya, one in Beit Hanoun, four east of Khan Younis and eleven east of Gaza City. All of the wounded were taken to hospitals in Gaza, where three cases were said to be critical. Medics on site treated others for excessive tear gas inhalation. Confrontations between young men and the occupation forces in Hebron, March 16, 2018. Photo credit: Mashhour Wahawah for WAFA. In the West Bank city of Hebron, the weekly demonstration against Israeli occupation culminated in the area between H1 (the side of Hebron that is under Palestinian Authority control) and H2 (the area that is under full Israeli control). Soldiers attacked protesters with rubber bullets, sound bombs and tear gas. The soldiers then entered the west side of the city to run after the demonstrators, despite the fact that the area is ostensibly under the control of the Palestinian Authority. 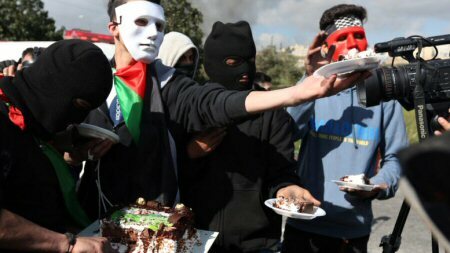 In the Nablus district of the northern West Bank, lively demonstrations were held in the villages of al-Lubban ash-Sharqiya, Beita, and Kufr Qalil. In al-Lubban ash-Sharqiya, the Palestinian Red Crescent treated 50 protesters for tear gas inhalation and injuries sustained by rubber bullets. Israeli soldiers stormed the village, invading homes and stores, and confiscated two cars. According to the Red Crescent, another ten Palestinians were injured in Beita village. In Kufr Qalil, 25 protesters required medical attention for tear gas and five for injuries sustained by rubber bullets. In Kufr Qaddoum village in the district of Qalqilia, soldiers attacked the weekly demonstration organized by the local popular committee against the settlements. Participants marched to the main entrance of the village, which has been closed by Israeli soldiers for thirteen years. They called on the Israeli occupation to open the road and condemned Trump’s recognition of Israeli annexation of Jerusalem. Soldiers opened fire on protesters and invaded the village, indiscriminately shooting tear gas into crowded residential areas. Confrontations between young men and Israeli occupation forces at the northern entrance of al-Bireh, March 16, 2018. Photo credit: Hamza Shalash for WAFA. In Ramallah, sixteen were injured – three with live fire, five with rubber bullets and eight suffered from tear gas inhalation – after Israeli soldiers attacked a peaceful demonstration at the northern entrance to the city. In al-Mughayyir village, east of the Ramallah district, two were wounded by rubber bullets when soldiers attacked the demonstration at the entrance of the village. Soldiers then invaded the village and shot tear gas into residential areas, causing dozens to seek treatment in local clinics. In the al-Maasara el Gharbiyya village, north of Ramallah district, seven Palestinians were treated for tear gas inhalation after soldiers attacked a peaceful demonstration in the village.